Cole Swindell Fan Party During #CMAFest with Merch Bundle On Sale Now! 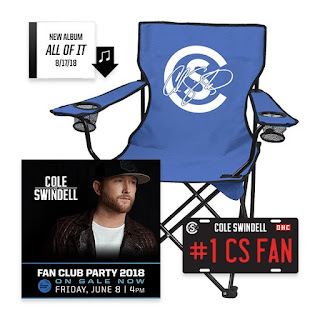 Includes: Exclusive Acoustic Performance By Cole, Meet And Greet With Cole, Photo Opp With Cole, Commemorative Event Laminate, Exclusive Autographed Merchandise Item, Interactive On-Site Merchandise Printing (Fans Can Select And Print A Commemorative Merch Piece! ), Snacks, Drinks, And More!